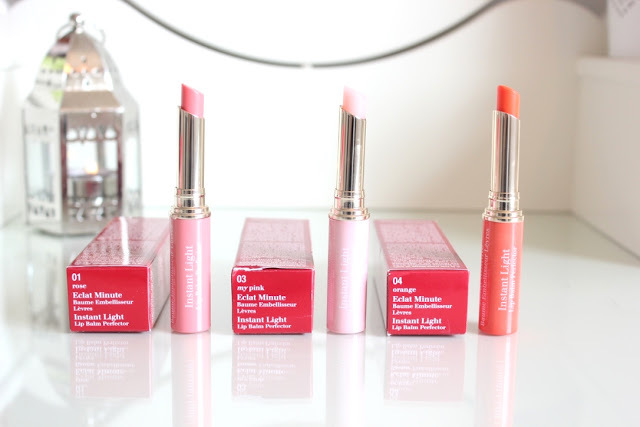 Sephora Extreme Liquid Lipstick €14.95 - I hate to tease all of you UK bloggers with a Sephora offering considering for some outrageous reason we don't have a single store here in the UK (does anyone actually know the answer as to why not?!) but this little beauty has been burning a metaphorical hole in my blogging pocket ever since I picked it up way back when in January. When James whisked me off to Barcelona just after Christmas I packed very little makeup and even less lippy, funnily enough the only night that I actually wore this was when we went to Camp Nou to watch a Barcelona match and I felt really poorly and rubbish all night so it was a total waste but boy, did it last! I'm not sure that a lipstick will go through much of a tougher test than at a football match, shouting, cheering, eating hot dogs and constantly sipping at drinks are possibly some of the biggest challenges that a lippy can come up against so I certainly gave it a run for it's money and it did not disappoint. Although the colour wasn't as vibrant upon our return, it was all still in tact. No flaking or creasing, no smudging and nothing on my teeth either. Win, win and win! For €15 this is such a fantastic lipstick, in terms of quality it is up there with the likes of Dior and even MAC and for a much more appealing price too. When it first goes on the colour is so bright and vibrant, a perfect pink toned red that really stands out and makes a statement. It's super creamy and even the applicator that it comes with is easy to use so no brush required! The actual bottle is nice and compact too, I liken it to the Stila Vinyl Lipsticks in that the finish is so vivd and solid however it's nowhere near as sticky and lasts much much longer, and it's cheaper too! I wanted to start doing a weekly round up post on here so you can easily see what video I put live and also what I've been posting about. Let me know if you think it's either a good or a rubbish idea! 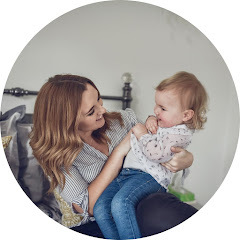 If I've done anything huge that week too that hasn't made it to the blog then I'll fill you guys in on a Sunday morning too! Fitness Tips - This week I decided to put some variety into my YouTube channel and really start to show that this blog is no longer 100% beauty. If you follow this blog or me on twitter then you'll know that I've been slowly but steadily losing weight for a long time now so I wanted to make a video to show you guys how I've stayed on track and what I've done to pull myself back when I haven't! I Love Coconut & Cream Body Spritz - Body Spritz' seem to be back with a bang and I shared my love for this sweet and summery scent all the way back on Tuesday! Illamasqua Skin Base - Thursday's review was an oldy-but-goody for me, I've owned this for I don't know how long and it seemed like perfect timing to finally review it as I've been reaching for this a fair bit recently! ...And that's about it really, no exciting news from me this week. I've been working hard on the Nottingham Blogger Meet 2015 which is now only two weeks away and just getting on with general life really! I've got a slightly more interesting weekend coming up next week which I can't wait to share with you all so I've had a quiet one this week. I hope that you've all had a fantastic week and are enjoying you weekend, see you soon! Illamasqua Skin Base Foundation £30.50 - On my MacBook I have a little collection of photos of products that aren't particularly new but that at some point I will probably want to have a little rave and a scream about, when I sat down to blog this evening this was the first photo that popped up in my gallery and I tell you now, it could not have been better timing. I have been loving this foundation recently, unfortunately it's slightly too pale for my current skin tone so if I don't have time to bronze myself up in areas then I can look a little ghostly but when I have the time to put some effort in to my makeup then this looks flawless. I wear this is most of my YouTube videos (although I only have 2 uploaded at the moment!) as it has no SPF so looks wonderful on camera. It's for that reason that this is always my go-to foundation if I'm going somewhere where I know I'll have my photo taken as nothing ever looks as radiant or picture perfect as this. It's a fairly medium to heavy coverage that's definitely buildable to hide even the most stubborn patches of redness or blemishes! I will admit that when researching this for my blog post, I was a tad surprised to see that it is now £30.50, I'm sure that I paid £27 for it around 18 months ago so to see that it's hiked up in price rather considerably is a shame, however it's only caught up to it's NARS and Chanel rivals so it's not hugely expensive. Another bug bear will Illamasqua is how sparse the stores are in the UK, I've only ever seen one in Sheffield, Birmingham or London and they're all so far from me that I can't really stock up a very good collection or easily go to get match for my summer shade. I won't part with that sort of cash without seriously eyeing up the goods in person first so for me, Illamasqua does often get over looked as a brand. When I do get the chance to try things I have never been disappointed yet, it's just a shame that they are so few and far between. Come to Nottingham Illamasqua! The bottle is also a little fiddly, you do have to catch it at the right angle to be able to squeeze any out, many a time I was desperately trying to dispense some on to the back of my hand and nothing would come out to play, now I've got the knack of it (and I can't really explain how!) it's just as easy as any other but for a £30+ price tag, a better design and a pump wouldn't really go a miss, surely? For me, this foundation is all about that finish. The fact that is so hard to get hold of does hugely put me off but let me tell you ladies, it is very much worth the treck. If you are ever near an illamasqua counter then I strongly urge you to try this out and maybe even have a risky purchase. Don't be phased by the elaborate makeup of the people on the counter like I was, they won't make you look like you're about to hit the town when it's 10.30am on a Wednesday morning unless you want them to. I won't personally be buying any more of this, or anything else from the brand for that matter, until I am physically in front of a counter again but that is more due to personal preference than anything else. If you're happy buying over the internet then go for it, but for me, I like the whole experience and the snazzy carrier bag that comes with it! 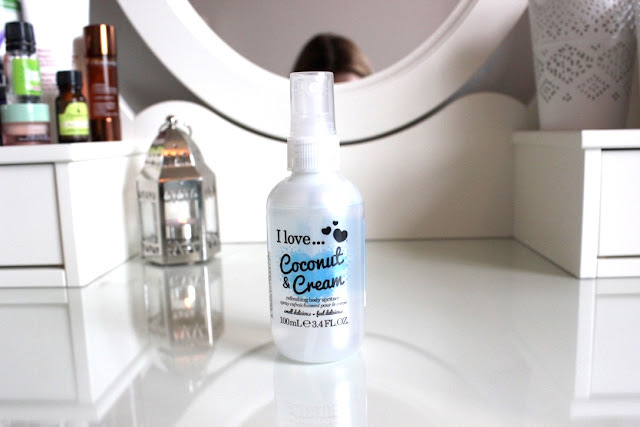 I love... Coconut & Cream Body Spritzer - At this time of year I always want to overload with the perfume just incase things get a bit..sticky. 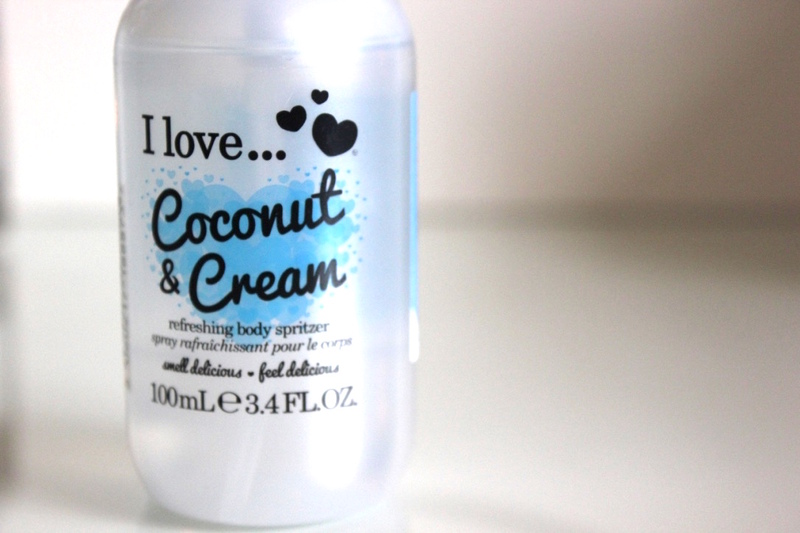 So as a cheaper alternative I love using Body Spritz' such as this offering from I love.. I am obsessed with the scent of Coconut at the moment as it just smells like summer to me and it so sweet and fresh. These spritz' are only small so they are perfect to pop in your handbag or beach bag and give yourself a light spritz after laying in the sun or possibly walking around and getting hot and sweaty! Us Brits are not used to this gorgeous weather so I always feel like I need to go overboard to cancel out any of the negative bits that come with. I also love using this for spraying around my house, although we only have one small dog and no carpets downstairs (puppy is NOT allowed upstairs!) I'm always super conscious that my house may smell of dog. I don't think that it does but either way, I like to walk in to a room and think that it smells nice, so I love to use this on my pillows and curtains just to give a fresh and summer scent to the whole house! These totally take me back to being an early teenager before being allowed to wear actually perfume and just having the "Charlie" body sprays, so it's a little nostalgic for me to! This will definitely be about my person at all times throughout this summer, I hate using up too much perfume and I actually feel that I can smell this on my skin for longer. 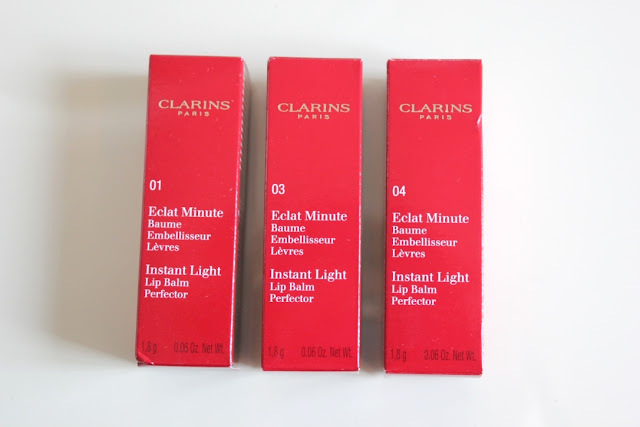 Clarins Instant Light Lip Balm Perfector* £18 - I have been obsessed with the Clarins Instant Light Natural Lip Perfectors for months now, they're so quick and easy to glide on and go and super easy to touch up throughout the day. 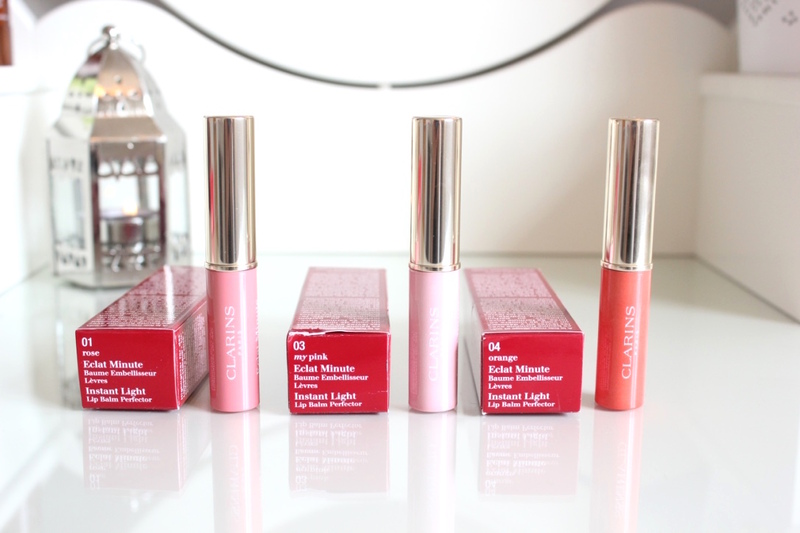 So when these Lip Balm version were brought out I was like a moth to a flame on the Clarins counter and eagerly trying to pick out which of the colours I simply needed the most. 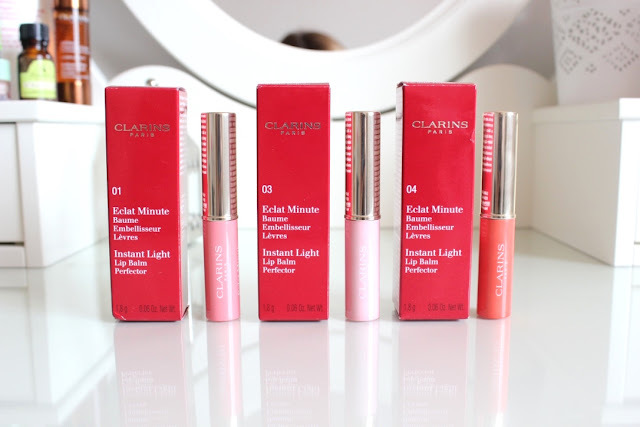 As always with Clarins they've produced a "my pink" that I believe adapts to the Ph in your skin to match your skin tone and create your very own, personalised shade of pink. This is my favourite shade of the three as, unsurprisingly, it goes with every look that I have and always looks super natural. I also love "rose" to wear for work as it's nice and subtle and just adds a tint of colour to my lips whilst also nourishing them. The one that I was sort of dubious yet really excited about what the Orange, I've never really gone past a "coral" on the orange-ometer so this was a step into uncharted territory for me but I can honestly say... I love it. It's perfect for summer and actually adds a spot of colour to a makeup look which is a welcome addition for me. So often in summer we're rushing out the door to make the most of the good weather, or I'm too hot or simply cannot be bothered to go all out with my makeup so having this in my stash really helps to make it look as though I have put in 100% more effort than I actually have. MAC Face and Body Foundation £29.50 - It's finally come to that time of year where I can start to switch up my foundation from a heavier winter one to something with less coverage to suit my summer skin. On really good skin days, I always turn to MAC's Face and Body Foundation, it is dewy beyond dewiness (even I have to put powder on after this) but still gives a really nice finish. I naturally want to wear more powder in the summer anyway to stop any naughty oils from peeping through my foundation so the fact that I have to "finish" this off with a powder really doesn't bother me and it doesn't go cakey in the slightest. If you want a foundation that just evens out your skintone and makes your skin look more uniform, then this is the one for you. It generally has very little coverage so it really does only come out on good skin days or when I'm rocking a pretty good tan but if you're confident with your skin then you could easily wear this all year round. You can layer it up by going back over your foundation again however I rarely have time for it, although this is one of the only foundations that I have found where you truly can go back over it. The other fab thing about the fact that it's not a heavy coverage is that you can get away with using it no matter how tanned you are, obviously if you go from too different extremes then it'll look obvious but I never have to stop and think about how tanned I am before putting this on, it always seems to be able to match up to how I'm looking that day. I have this in N2 so I think that's a fairly medium tone, and although I don't wear this in the winter due to wanting a fuller coverage, I can start wearing it as soon as my skin looks good enough right through the summer, no matter how tanned I manage to get in this English sun! Another fabulous thing about this foundation is that you can buy it in different sizes, I went for broke and got the 120ml size and it has lasted me absolutely ages so far, but you can also get the 50ml version for £22, meaning that if you're unsure or you just want it for summer, then you can purchase the smaller size. I also like to mix in my NARS Copacabana highlighter just to add an extra something which makes it super dewy and just gives you that extra glow. This foundation is my absolute go to when I want a "no makeup makeup" day or if I'm just hanging around the house with James and don't want to put too much makeup on but still want to do something. This is the foundation that I will probably be reaching for most during this summer, especially on the weekends if we continue with this beautiful weather!